(Phys.org) —A palaeontologist from our University studying fossils that were kept in a museum in Canada for over 75 years has discovered a new species of dinosaur. Dr Nick Longrich from our University studied the fossilised bones of two horned dinosaurs from the ceratopsian family and found that they were in fact two previously unknown species. The findings reveal that the dinosaur species from this region were much more diverse than first thought. "We thought we had discovered most of the species, but it seems there are many undiscovered dinosaurs left," said Dr Nick Longrich from the University's Department of Biology & Biochemistry. "There are lots of species out there. We've really only just scratched the surface." One of the new species represents a new species of Pentaceratops, named Pentaceratops aquilonius. Pentaceratops, a smaller cousin of Triceratops, belong to the Chasmosaurinae, a group of large, horned dinosaurs characterised by long brow horns and elongate frills. Around the size of a buffalo, they were a major group of plant eating dinosaurs in western North America at the end of the Cretaceous Period, around 75 million years ago. The other appears to represent a new species of Kosmoceratops. 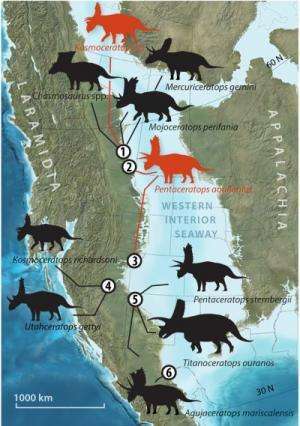 Western North America hosted a remarkable diversity of dinosaurs during the Campanian period. Among the most diverse clades was the Chasmosaurinae. Up until now, ten chasmosaur species have been recognised from the upper Campanian of western North America, with distinct species occurring in the northern and southern parts of the continent. The fossils studied by Longrich were previously classified as Anchiceratops and Chasmosaurus, species known from Canada, but after re-analysing the skeletons, he realised they more closely resembled dinosaurs from the American Southwest. One was closely related to Pentaceratops sternbergii from New Mexico, but is a more primitive species, named Pentaceratops aquilonius. It was smaller, and differed in the shape of the frill and arrangement of the hornlets on the back. The other seems to be related to Kosmoceratops from Utah. It seems to be a new species as well, but more complete fossils are needed to be certain. Published in the academic journal Cretaceous Research, Longrich proposes that distinct northern and southern provinces existed during the Campanian, but that there was exchange between them. The dinosaurs would spread from one part of the continent to the other and then diverge to form new species. Competition between the different species then prevented the dinosaurs from moving between the northern and southern regions. Longrich added: "The distribution of dinosaur species was very different from the patterns seen in living mammals. "In living mammals, there tend to be relatively few large species, and they have large ranges. With Cretaceous dinosaurs, we see a lot of large species in a single habitat. They also tend to be very regional – as you move from one habitat to another, you get a completely different set of species." These patterns help explain why palaeontologists keep finding more species – when they sample different habitats, they find different species. Longrich speculates that dinosaur biology may cause these patterns. He said: "In this sense dinosaur biology seems quite different from mammal biology. It could be that mammals are more intelligent and so they tend to have more flexible behaviour, and adapt their behaviour to their habitats. "On the other hand, dinosaurs may have had to adapt themselves physically to survive in a different habitat, and evolved new species. Perhaps that's the reason why there are so many species." More information: Nicholas R. Longrich, "The horned dinosaurs Pentaceratops and Kosmoceratops from the upper Campanian of Alberta and implications for dinosaur biogeography," Cretaceous Research, Volume 51, September 2014, Pages 292-308, ISSN 0195-6671, dx.doi.org/10.1016/j.cretres.2014.06.011.